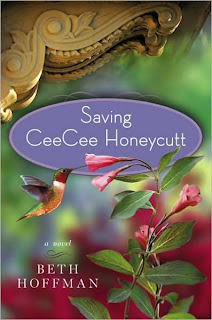 As some of you may recall from this post, Saving CeeCee Honeycutt became an instant favorite for me and one I could not stop raving about and encouraging everyone I knew to read. That may sound like a slight embellishment, but truly, it is not. And though our communication has been in the form of tweets, direct messages and blog comments, I honestly feel as though I could call this talented woman a friend. And when she was kind enough to agree to a question and answer session for this blog, I was elated! Was there a specific or series of moments in your life that you knew you wanted to be an author? Before beginning my writing career, I was president and co-owner of an interior design studio. Though I had written fiction since the age of twelve and often dreamed of becoming a novelist, it was a secret dream that I rarely discussed. But after I nearly died of septicemia, something inside me made a dramatic shift, and that’s when the longing to write a novel grew stronger and stronger. For several years I waffled back and forth, wondering if I really had what it took to write successfully, but as time passed, my longing intensified. Then, on a snowy Monday in January of 2004, it was like the universe cracked open, and I knew in an eye-blink that if I were to write a novel, it was now or never. By April I sold my portion of the design business, kicked off my high-heels, and began to write. It’s the gutsiest thing I’ve ever done. Where did the inspiration for CeeCee come from? I’m fascinated by the complexities of mother/daughter relationships. Plus, I adore eccentric personalities and the culture of the American South. I wanted those elements to be the foundation of my story. But he first spark of my novel ignited when I was nine years old. I had taken the train to visit my Great Aunt Mildred Caldwell who lived in a lovely old Greek revival home in Danville, Kentucky. Every day my great aunt took me somewhere interesting. She’d drive through town, chattering like a sparrow about how wondrous life was if we’d just opened our eyes. She was a true Southern lady who possessed great charm and kindness. Without that magical experience, I doubt the story of CeeCee would have formed in my imagination. Though there are many messages and values to be gained throughout CeeCee’s journey, would you say there is one in particular that you hope readers walk away with? Growth and personal freedom can only occur when we forgive others and ourselves and embrace life with both hands. Would you say that you've had to sacrifice anything follow your dream? I can honestly say that I’ve not sacrificed a thing. Every day I feel blessed, and every day I’m so glad I found the courage to go after my dream. I work crazy hours—my body aches from sitting at the keyboard for too long, and I have trouble with my “mouse arm” going numb, but those things are a small price to pay for doing what I love. Who encouraged you, whether directly or indirectly, to start your writing career? Actually, no one encouraged me to end my design career until I actually made the decision. But from that day forward, one person totally believed in me, and that person is my best friend, Marlane. Who or what has been the most influential in your life? No one person has been influential, but books have always been a huge source of inspiration, as are nature and animals. What would you say is your favorite book of all time? And what do you believe everyone should read at least once in their lifetime? You mean besides CeeCee? LOL! Actually, this is an impossible question for me to answer because we all have such different tastes in what we read and enjoy. After reading about Aunt Tootie's and Mrs. Odell's love for gardening, I have to know; do you have a flower garden? Any orchids? Yes, I have flower gardens, and I adore the solitude of gardening. My favorite flowers are peonies but I don’t have any orchids. What is one thing every woman should know? That she is her own source of power, and that nobody can give her that power, nor can they take it away without her consent—her thoughts, attitudes, and decisions will, in large part, create her experiences. Where is the one place you hope to see before you die? I’m fortunate to have visited the places I really love—Italy is my all-time favorite. But here’s a little secret: I’m a card-carrying introvert and I don’t like traveling very much unless it’s for book research. I try to be kind, and I hope that trait would be remembered, also a lifetime of animal rescue, and a wacky sense of humor. And finally, any chance of a CeeCee sequel? That’s hard to say, but I suspect not. CeeCee was the perfect age for the story, but to take her forward into teenage years might run the risk of spoiling the magic of her young life. But as the old adage goes—never say never. I thoroughly enjoyed getting to know Beth a little better through reading her answers and I hope that each of you have the opportunity to read this incredible journey of CeeCee. I assure you, you will not regret it. Thank you so much for inviting me to visit your blog and chat with you. I'm delighted to be here and tickled that you enjoyed CeeCee's story. I appreciate your kind words! That is so awesome! Way to go Maggie. I can't wait to read the book! !